RA and Anti-CCP: What is the Purpose of an Anti-CCP Test? Anti-cyclic citrullinated peptide (anti-CCP) is an antibody present in most rheumatoid arthritis patients. Levels of anti-CCP can be detected in a patient through a simple blood test. A positive anti-CCP test result can be used in conjunction with other blood tests, imaging tests, and/or physical examination findings to diagnose rheumatoid arthritis. A patient with rheumatoid arthritis who has positive blood tests for anti-CCP has what is commonly referred to as seropositive rheumatoid arthritis. Alternatively, a patient with similar symptoms but negative blood work is referred to as having seronegative rheumatoid arthritis. A positive anti-CCP test result can be used as a prognostic tool to determine the severity of symptoms the patient may have throughout their disease course. Anti-CCP positive patients can potentially experience a more aggressive disease course. However, this can also depend on many different factors and varies between each individual. The prognosis of anti-CCP positive patients also depends greatly on early diagnosis of rheumatoid arthritis as well as early initiation of treatment. Anti-CCP is an autoantibody. This means that the patient’s immune system produces antibodies that identify the patient’s cells as foreign material and as a result, attack its own normal cells. These attacks can produce inflammatory symptoms most commonly experienced in rheumatoid arthritis. Testing for the presence of anti-CCP is a relatively new support tool in helping doctors diagnose rheumatoid arthritis. Prior to the discovery and testing of anti-CCP, most doctors used rheumatoid factor (RF) – another antibody – as a test to help reach a rheumatoid arthritis diagnosis. Anti-CCP is thought to be present in 60% to 70% of patients with rheumatoid arthritis. They are present early in the disease process and have not been found consistently in any other autoimmune disease syndrome. Anti-CCPs can also exist in a patient for years before they ever develop clinical rheumatoid arthritis symptoms. Anti-CCP positive testing is also used to help doctors deliver a prognosis because many anti-CCP positive patients experience severe rheumatoid arthritis symptoms. As a result, this test also helps doctors pursue specific and possibly more aggressive treatment options. The specific cause of developing anti-CCP antibodies in patients is unknown. It is thought to be a combination of genetics and environmental factors. Researchers have found that anti-CCP positive rheumatoid arthritis patients have a common sequence of amino acids called the shared epitope, which is encoded in specific genetic markers called human leukocyte antigens (HLA). The HLA produces proteins that are responsible for controlling immune responses. Some researchers believe that the shared epitope is what attaches to these proteins and produces the anti-CCP antibodies. Some researchers feel that there is a strong connection between smoking and rheumatoid arthritis patients who have this shared epitope. It is hypothesized that the lung inflammation caused by smoking could possibly lead to developing the anti-CCP antibodies in patients who possess this shared epitope. Anti-CCP is a blood test. A blood sample is drawn from the patient and analyzed in a lab. If the sample finds the presence of anti-CCP at a certain level, the result is positive. Low levels of anti-CCP can be found in the test results of certain patients but may not enough to produce a positive result. Re-testing later on may be required in patients who continue to display clinical rheumatoid arthritis symptoms. What Do Anti-CCP Test Results Mean? If a patient tests positive for anti-CCP, it doesn’t immediately lead to a rheumatoid arthritis diagnosis. Rheumatoid arthritis is a clinical diagnosis. In addition to laboratory criteria, a patient must also exhibit clear clinical symptoms that are consistent with rheumatoid arthritis. These symptoms must also occur for more than six consecutive weeks and meet certain criteria such as how many joints are involved and where they are located on the body. In some cases, patients who display symptoms of rheumatoid arthritis but who test negative for anti-CCP could still have rheumatoid arthritis or develop it in the future. Again, this is referring to the seronegative rheumatoid arthritis group. Some of these patients will convert to seropositive rheumatoid arthritis during their disease course, which is why they may be tested multiple times over a period of years. In certain cases, positive anti-CCP tests may also indicate the possibility of other conditions besides rheumatoid arthritis. Anti-CCPs have shown to be present in patients with other connective tissue disorders like systemic lupus erythematosus (SLE). 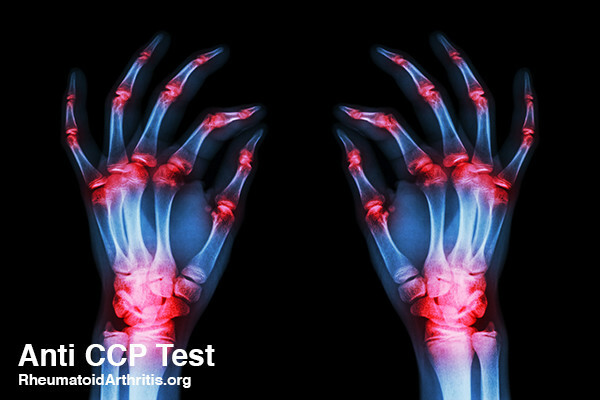 Despite these rare cases, a positive anti-CCP test is considered highly specific to rheumatoid arthritis (meaning a negative test does not rule out the disease, but a positive result rules it in). In order to reach a rheumatoid arthritis diagnosis when a patient tests positive for anti-CCPs, several other criteria must be met. Doctors will perform a physical examination to look for clear clinical symptoms of rheumatoid arthritis. Other blood tests are also performed in conjunction with the anti-CCP test, including testing for rheumatoid factor (RF) antibodies and increased inflammation levels. Doctors will also use imaging scans to observe any signs of bone and cartilage deterioration around the affected joints. The anti-CCP test is thought to be slightly more specific than RF for diagnosing rheumatoid arthritis. The reason for this is RF is present in patients without rheumatoid arthritis who have other autoimmune disorders. Research has shown that rheumatoid arthritis patients who test positive for anti-CCP could potentially experience a more aggressive set of symptoms and more severe damage to the affected joints. Frequent flare-ups and reduced remission periods can be expected in this group of patients. A seropositive result could mean an overall more severe disease course than rheumatoid arthritis patients who are classified as seronegative. Anti-CCP positive rheumatoid arthritis patients generally receive the most aggressive treatment options available including taking disease-modifying antirheumatic drugs (DMARDs) and supplementing with anti-inflammatory home remedies to provide symptom relief. A positive outlook depends on early detection of symptoms followed by a diagnosis. The earlier someone can be diagnosed with anti-CCP positive rheumatoid arthritis the sooner targeted treatments can be initiated. Early detection can help patients to maintain their quality of life and prevent the severe progression of rheumatoid arthritis. The RASN is a non-profit team of healthcare professionals, and RA warriors who are committed to helping people with rheumatoid arthritis live full, happy lives despite their diagnosis. The cost to maintain this website grows each week. As we do not wish to plaster large banner ads throughout the site we have an advertising relationship with some of the offers displayed here. However we do not offer any products or services that haven't been thoroughly vetted by us. Nor do we recommend anything we wouldn't use ourselves. Most recommended products are used daily by our team and paid for with our personal money. We keep the number of high qualtiy advertisers very low. RASN is dedicated to providing the most up to date and trusted information. If anything fails to meet your standards in any way please contact us so that we may consider removing it from our recommendations.